A couple who have been childless after ten years of marriage welcomed quintuplets on Monday, January 9th at the University of Calabar Teaching Hospital, UCTH, Cross River State.The Cross River Government yesterday said that the babies are the first quintuplets in the state’s history. Dr. Linda Ayade, the first lady of Akwa Ibom state, donated One million naira to the family of the quintuplets with an incubator for the management of the new babies. Dr. Linda Ayade, Commissioner of Health, Dr. Inyang Asibong and the DG of the Primary Health Care Development Agency, Dr. Betta Edu, arrived at the UCTH to witness what the hospital management says is the first of it’s kind in the facility. General Overseer (Worldwide) of the Redeemed Christian Church of God (RCCG), Pastor Enoch Adeboye, has warned the Federal Government to stop meddling in church matters. “The government has been showing increasing interest in church affairs. 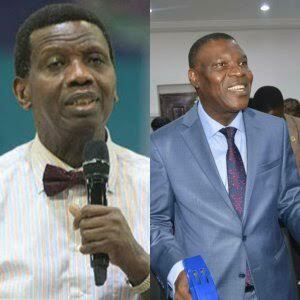 Unfortunately, for us in RCCG, it might not be very helpful,” Adeboye said. Charles Obong, 52, who worked as a senior personnel officer in the ministry of Public Service from 2006 to 2016, reportedly wanted to use the cash to redeem his soul before God, DailyMonitor reports. Obong reportedly saved more than Shs200 million (about N17m) to bribe the Almighty Father on Judgement Day so He could forgive his earthly sins. He died on December 17, 2016, after a long illness and was buried on Christmas Eve. At least 15 people who specialized in hunting grasshoppers popularly called ‘Fara’ in Hausa have been slaughtered in the bushes between Gubio and Mobbar Local Government Areas of Borno state by suspected members of dreaded Boko Haram sect. Sources have said. The incident which happened a week ago have caused scarcity and raised the price of the commodity in Maiduguri, the state capital, as a small measure of fried Fara which stood at N500 in the past now sales between N1200 and above. According to a security source who were mobilized to the scene told Vanguard that the insurgents clashed with the victims in the bushes near Kareto community, north of the state. This incident is coming barely two weeks when the military of ‘Operation Lafiya Dole’ reopened the Maiduguri- Gubio- Damasak road for motorists. Jailed members of Brazil's most powerful drug gang killed 31 inmates at a penitentiary on Friday, decapitating and cutting out the hearts of most of them, in revenge for a separate prison massacre that left 56 dead this week. The savage attack in the Monte Cristo prison in the state of Roraima, was carried out by members of the First Capital Command (PCC) gang. 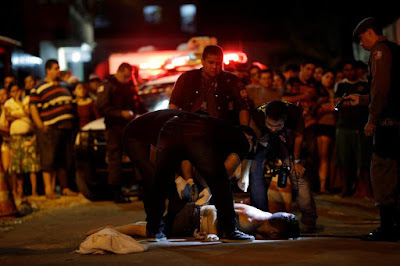 The PCC itself was targeted on Sunday in neighboring Amazonas state in Brazil's worst prison slaughter in more than two decades.Horrific images taken inside the jail posted online shows the bloody aftermath of the slaughter. Adeboye made the announcement during the church’s annual thanksgiving held at the 3km new auditorium today 7th January 2017.